Painting in the late Mannerist style, Pagani executed several passionate works for churches throughout Florence. His father, Francesco Pagani, is said to have been a painter as well. Gregorio’s early training was with Maso da San Friano (1536 – 1571) and then with the Contra-Maniera (Counter Mannerist) painter, Santi di Tito (1536 – 1603). His style took in new approaches when he befriended Lodovico Cardi, called Cigoli (1559 – 1613). Together they learned from the Venetian School and Emilian School of painting, as well as from the works of Correggio (1489 – 1534). Of his work most influenced by Correggio, is his vividly colored, Madonna and Child with Saints Francis, John the Baptist, Margaret and Gregory, as well as his Finding of the True Cross. In his work, Piramus and Thisbe now in the Uffizi Gallery, can be seen a strong development in his expressive style and skillful positioning of figures to convey a narrative presence. The artist had a noted interest in portraying naturalism in his work, formed during his friendship with Cigoli. His later works revealed this preference even more so, such as his work, Saint Lawrence, in the Basilica of Madonna delle Grazie at San Giovanni Valdarno. 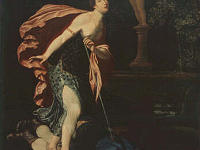 Pagani also befriended the Italian painter Bartolomeo Carducci, called Carducho (1560 – 1610), who introduced Spanish art into his influence. This is seen in Pagani’s late work, such as his piece, Adoration of the Magi, from 1603. Pagani was one of the leading painters of the Florentine School at the time, bringing rich colors and a detailed drawing style to the late Mannerists period. Of his noted pupils was Cristofano Allori (1577 – 1621), son of Alessandro Allori (1535 – 1607).